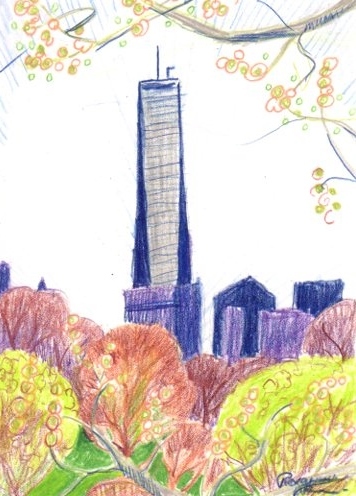 As usual, I did a 5×7 sketch before working on the full size version of “Freedom Tower”, the working title. Once I’ve gotten finished using this to work from, I may put it up on Ebay, someone might want it. Anyway, I still have to work on getting the verticals and horizontals right. But I do think I captured this special, but fleeting time of year, before it was too late. Previous PostFreedom TowerNext PostNo Place Like Home…..